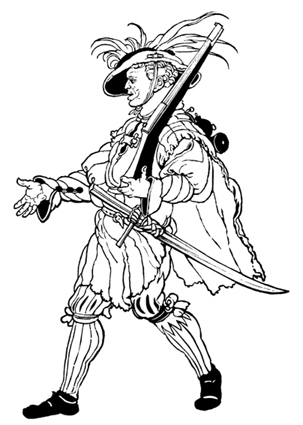 Recently I've been looking for Landsknecht's stuff in the range of 1487- 1527 years. However, what I most had difficulty finding was regarding how was the use of Kriegsmesser (or even other types of Messers itself) among them. I mean, although these swords are ALWAYS associated with them, I did not find more than two pictures representing them. In fact, the only sword that really seems to be popular is the Katzbalger, which is better suited to fight in pike formations (and I guess it would be cheaper than messers). This ends up leading me to think that this type of weapon was not necessarily used by common Landsknecht but by Doppelsoldners. The Doppelsoldners were the only ones who could use other weapons that weren't the pikes: halberds, zweihanders, partisans and arquebuses. In fact, what really made me think that they were used by Doppelsoldners was the illustration of a Arquebusier with a kriegsmesser or grosse messer (I do not exactly know the difference) on his waist. But they were necessarily more common among arquebusiers than others? Why it was a less popular sword that Katzsbalger even among Doppelsoldners? Can we could see these few representations as an evidence for a not so significant popularity? What kind of soldier usually had this type of sword in 15th/16th's Germany? I think it is safe to say that yes, it was not as widely used as the katzbalger... like straight-bladed two-handed swords, it is simply not an appropriate "standard issue" weapon for landsknechts fighting in close formation. You might also search for illustrations that are not strictly speaking military scenes... here is a horseman carrying a large messer from a hunting scene by Lucas Cranach, c. 1506. Possibly this specific figure is an attendant or guard of the more richly dressed hunters with swords and crossbows? But in this case, the Katzbalger was kind of secondary weapon that most, if not all, soldiers had. Zweihander in this case was the specific main weapon of certain members of the "suicide squads" and other front lines of doppelsöldner (almost 50% of the Black Band's Doppelsoldners were two handed swordmen). These two-handed swordsmen also had Katzbalgers as secondary weapons. I just think they might have some messer adhesion because many of these two-handed swordsmen were trained at fencing schools, like the Marxbruder Schools around Germany.